A balding taxi passenger is wanted by police for spitting at people in the street in the Seven Dials area. 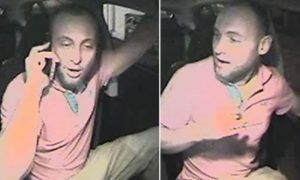 Sussex Police published CCTV images and said: “Do you recognise this man who spat at two people from a taxi? “Two men were walking at the Seven Dials at around 7pm on Friday 20 January when a man in a taxi shouted ‘hey lads’ out of the window. PC Russ Watson said: “We now have images from the taxi of the man we believe may be connected to this incident. “The incident was completely unprovoked as the two men were walking and didn’t recognise the suspect at all. “He is described as in his thirties, balding or had a shaved head and light facial hair.